Diageo’s $2.1 billion acquisition of United Spirits has helped India’s largest liquor company and its chairman Vijay Mallya. But hopes that Kingfisher Airlines will fly again simply because the grounded carrier’s flamboyant founder has raised some cash look overoptimistic. The Diageo deal gives Mallya some much-needed cash. Selling a near-13 percent stake in United Spirits will bring in close to $450 million, according to Breakingviews calculations. True, most of the shares have been pledged as security for loans. But those were agreed when United Spirits was trading at about half the 1440 rupees per share that Diageo has agreed to pay. Assume that the banks applied a haircut to the share price at the time, and it’s possible that Mallya will get to keep about $300 million from the deal – even after repaying the loans. However, this alone will not save Kingfisher, which has accumulated losses of $1.3 billion and has not flown since early October. 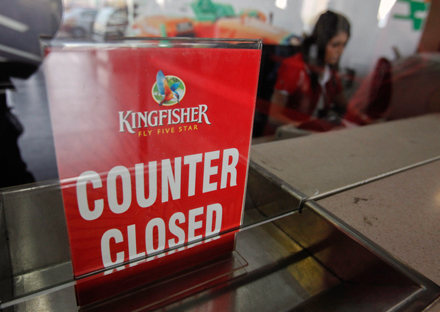 The immediate hurdle is Kingfisher’s operational licence, which is currently suspended and expires on Dec. 31, unless the government extends it. Potential strategic investors, including overseas carriers that have recently been allowed by the government to invest in local airlines, could commit funds subject to the carrier’s licence being restored and renewed. But they would also want state-owned creditors to agree to restructure Kingfisher’s $1 billion of long-term debt. That presents a second problem: One round of debt restructuring took place in March last year, but it wasn’t sufficient. Creditors may be open to further concessions since they wouldn’t recover anything much if the airline shuts down. But the lenders first want a $1 billion equity infusion, and they want some of it to occur immediately. The third and the biggest hurdle to reviving Kingfisher is government policy. Fuel taxes are irrationally high and Air India’s ticket prices ridiculously low. With assured access to taxpayer-funded bailouts, the state-owned carrier keeps private airlines gasping for profits. It will take a particularly brave knight to ride to Kingfisher – and Mallya’s – rescue. How can India’s Liquor Baron keep his Kingdom? Indian tycoon Vijay Mallya has played down any link between plans to revive Kingfisher Airlines, his grounded carrier, and his decision to sell a controlling stake in India’s largest liquor company, United Spirits, to Diageo. Kingfisher’s share price rose 4.7 percent on Nov. 9.